Shop our selection of leather motorcycle jackets & vests from Unik, popular styles like the classic leather biker jacket and scooter styles jacket with euro collars. Unik International continues a leader in the motorcycle apparel industry. 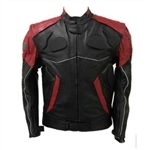 When you purchase a unik leather motorcycle jacket you are purchasing a leather jacket that is built to last and made with a bikers true riding needs in mind. Be sure to check out our most popular selling leather motorcycle jacket the Unik 305 Euro collar riding jacket.